I just bought this Shark RSI helmet, finally buying a new lid to replace my Suomy Spec 1. I initially heard of Shark from a friend who has one and loves his (he has a Shark RSX). I did a little research into the company and found they had a good reputation and had been producing helmets for almost 30 years. All this seemed fine and normal for a good manufacturer, the one thing that really stood out was that they produced the entire helmet themselves. I like this because I didn't want a helmet that was just re-branded. I also found out it is the number one selling European helmet brand and only recently got into the U.S. Market (which would explain why I knew very little about them to begin with). I ended up deciding to go with RSI, I liked the Shark brand, and I liked the styling so I bought the helmet. I went to Sum of All Parts a reputable online retailer that was running a special on the Shark RSI and ordered it. When I received the RSI I immediately inspected it and made sure there was no shipping damage, and of course it was fine. My first impression was the size of the vents on the top and bottom of the visor, they had huge inlets shaped around them, not sure if they're actually bigger or just appear that way. The Shark also had vents inside the liner which I've never seen on a helmet before. Ventilation is very important to me as I live in the south where the summers can be brutal on a motorcycle and air getting through the helmet is a must. I also like that I can swap the visor out easily with the quick release, I hate the feeling that I'm breaking the mount every time I go to change the visor. I put the helmet on and it felt great, perfect pressure around my cheeks and not too much on my forehead. I wear an XL Suomy so I bought an XL in the Shark, even though I had heard they run a bit small. So it felt good and looked great, time to take a ride. First impression is the SRI is much more quiet than my Suomy, I don't usually wear earplugs (I know, I know) but I don't. While the vents looked much bigger on the Shark I didn't really notice additional air through the helmet, but I didn't have an ventilation problems (fogging up the visor or just getting too hot). I suppose helmet vents are one of those things that you only really notice when they're not working. The visor on the Shark was much less flimsy than my Suomy, I'm not sure if the material is stronger, the mounts are better, or if my old helmet was just worn out. Either way the SRI visor action was much smoother and easier. My riding experience with the SRI was very positive and I think the only real complains I have are aesthetic really. Nest one will probably just be a racer replica like the Guintoli. Overall I rate the Shark RSI 9 out of 10. It surpassed my expectations and while I only have about 100 miles on it right now I know it will continue to perform. As time goes on I'll try and update this post, certainly if I notice any problems from use or age, if not you know I'm out enjoying it. One of my helmets is a Shark S650. It has its pros & cons like any helmet. Much like your experience, the S650 has good ventilation, w/ nice quality liner & well fitting cheek pads. My opinion on the quality of the visor construction & removal, mirrors your own. I wear a size Large in most any brand, & the Shark was no different for me. Like anyone who has worn helmets for any length of time, we know that different brands fit different head shapes. What will fit one person like a glove, may be uncomfortable to the next. I found that my Shark fit very similarly to my Shoei RF1000. However, the outer profiles are very different. The Shark has a taller profile but does taper to the front more so than the Shoei. Preference is for the rider to decide though, like any piece of gear. At the price point that some models of the Shark are offered, its good value for the money. I believe my Shark was in the low 200's when I got it...but that was 2+ yrs ago now. Still, the quality to price ratio is certainly there. Your right, the profile is very different than my Suomy and I have had problems fitting my giant head into a few brands, but the Shark fit me very well. It feels much more snug still, but I went on a fairly long ride on Saturday and had no problems with it getting uncomfortable. We'll see how it breaks in. 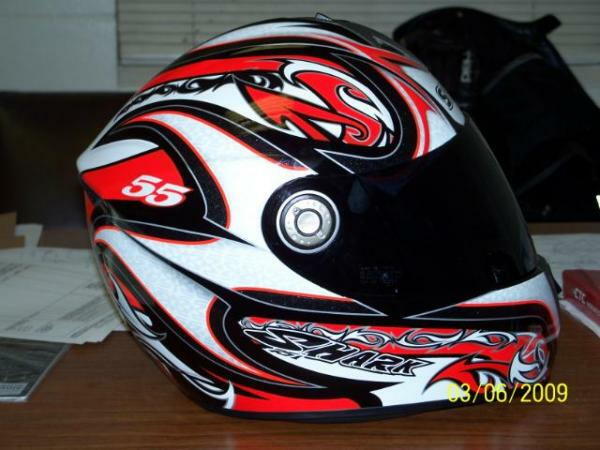 i had a shark as my first lid, and honestly was not overly impressed. my visor would fog up after like 5minutes of riding, the button snap broke off after a week and after a couple months the inner liner got all flat and made the helmet fit pretty loose. on a brighter note, it protected my noodle pretty well during my highside other than the visor getting blown off, so i guess it did the job that it was meant to do. Another really happy customer here. I've had a few shoei and arai and my noggin is way more confortable with the shark RSI. Mind you, this specific model is best suited for people with a rather straith shaped head on the sides, if you have a very rouded shaped one, it will be disconfortable. Here in Europe they're pretty much the same price as shoei and arai and the quality truly is on par with them: quiet, really light, excellent liners, top notch paint without flaws, the best visors ever and the impact tests shows the pedigree. to the op- is this the one you're looking for?